Shane Jones is one of those authors who can only be called incomparable. Every one of his books is a unique reading experience unlike anything he, or anyone else, has done before. 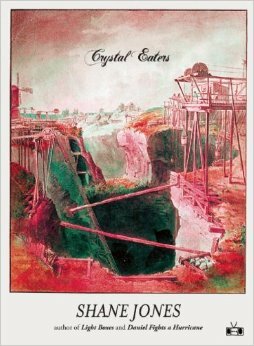 With Crystal Eaters, Jones’s third novel and his first release with indie powerhouse Two Dollar Radio, the author has delivered a strangely beautiful and surprisingly heart-wrenching tale that mixes fantasy, poetry, science fiction, and even something akin to rural noir. Crystal Eaters follows Remy and her family as they try to cope with her mother’s terminal sickness and the fact that the city is threatening to devour their town. Where Remy lives, everyone believes that people are born with 100 crystals inside that are slowly depleted throughout life, losing some every time a person has an accident or illness, or suffers a traumatic event. When you reach zero, you die. And Mom is approaching depletion fast. With a brother lost to them thanks to crime, a father whose inaction is only matched by his frustration, and a city that considers Remy’s town a backwards place and is encroaching on them at breakneck speed, the young girl sets out to accomplish something no one else has, even though it has been a collective obsession for many years: to increase her sick mother’s crystal count. Between crystals that are drugs, horses that run between fantasy and the real world, Remy’s brother’s bizarre, violent story running parallel to his family’s, a city that expands too quickly to be witnessed, and the family’s slow descent into heartbroken gloom and desperation, Crystal Eaters is an incredibly rich narrative full of interesting elements and beautiful writing. In fact, it could be said that Jones tried to do too much, that his powerful imagination filled the narrative with side stories and a plethora of elements that are never explored in-depth simply because the book comes in at just under 200 pages. However, the depth of his main characters, the power of Jones’s writing, and the unshakable dreamlike atmosphere of the novel make its sprawling nature seem almost natural, like the ordinary outcome of living in an interstitial space between this world and one where fables are truth. One of the things that make this book a recommended read is the surreptitious way in which the author tackled a few serious issues without ever leaving the myth-filled world he created. The average reader won’t have to perform academic-level textual deconstruction to find a commentary on gentrification just below the surface of the encroaching city, or an exploration of the tumultuous space in which familial ties, love, guilt, and vindictiveness meet. Besides the narrative, this book is appealing on a physical level. From the otherworldly cover art to the high-quality paper and the fact that page numbering starts at 183 and descends from there, this tome stands out. Crystal Eaters is at once a heartbreaking family saga, a drug-infused sci-fi dream, and an unusual narrative about pain and mortality. Shane Jones has built a career on his ability to mix stunning prose with fresh ideas, and this one is yet another reason to be excited about whatever he does next.